When you’ve got a legendary party-girl junkie turned sober-starlet saying you have a drug problem, you probably have a drug problem. In case you haven’t heard (and if you haven’t, I hope you like the rock you live under), Charlie Sheen checked himself into an un-disclosed rehab facility on Friday seeking treatment for his obvious demons. In theory, anyway. I wouldn’t be at all surprised if he checked himself out come Monday morning. Clearly Lindsay Lohan knows what she’s talking about. 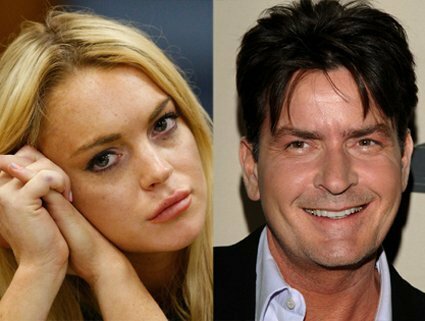 …after Sheen decided to check himself into a treatment center Friday afternoon, Lohan is confident he can get his life back together … if he commits himself to sobriety. Wouldn’t it be hilarious if Lindsay Lohan became Charlie Sheen’s sponsor? Speaking of which, whatever happened to Charlie’s sober coach who was supposed to stick to the actor like glue? previous post: Jason Davis Arrested For Drug Possession. Again.